Order your own copy of the Legend of the Five Rings Roleplaying Gamemat at your local retailer or online through our website today! From the Shadowlands hordes to the south to the deadly words nesting in courts across the land, the Emerald Empire is a dangerous place. As the samurai wield their words in the courts and their blades on the battlefield, so to do players of Legend of the Five Rings Roleplaying need their own tools to survive in Rokugan! 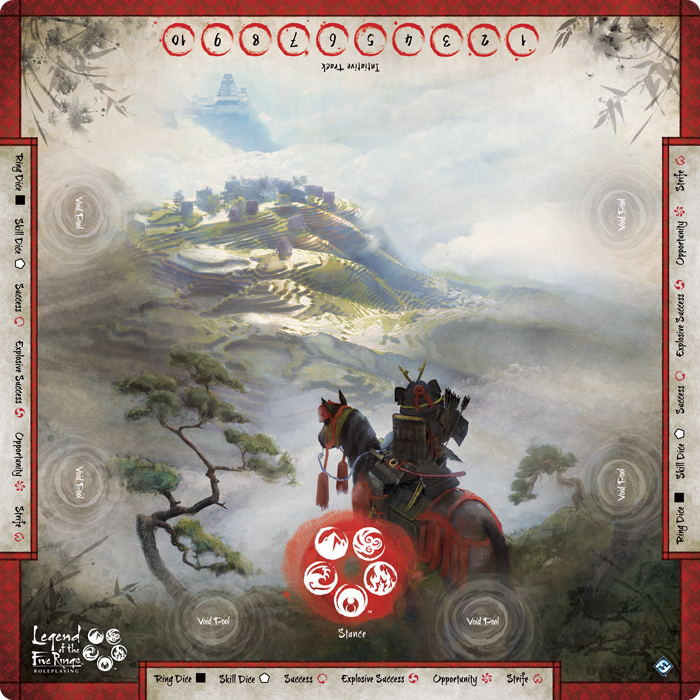 Fantasy Flight Games is proud to announce the Legend of the Five Rings Roleplaying Gamemat! This 26” x 26” rubber gamemat keeps your roleplaying sessions organized while immersing your group in the world of Rokugan! The Legend of the Five Rings Gamemat features helpful information for the Game Master and players alike. An initiative tracker along the Game Master's side of the mat lets every player quickly view a visual indication of their relative initiative value during an encounter, while keeping track of their character's current stance via a seperate tracker in the middle of the mat. Finally, various void pool locations and helpful symbol references spread across the mat help players track their void points and instantaneously interpret any roll of the dice. Coordinating a battle in Legend of the Five Rings Roleplaying has never been easier with this gamemat at your side! The Emerald Empire will swallow samurai whole without proper guidance. Make sure you have the proper tools when you explore Rokugan with the Legend of the Five Rings Roleplaying Gamemat! Immerse yourself in Rokugan with the Legend of the Five Rings Roleplaying Gamemat (L5S18), available now for pre-order from your local retailer or our website!